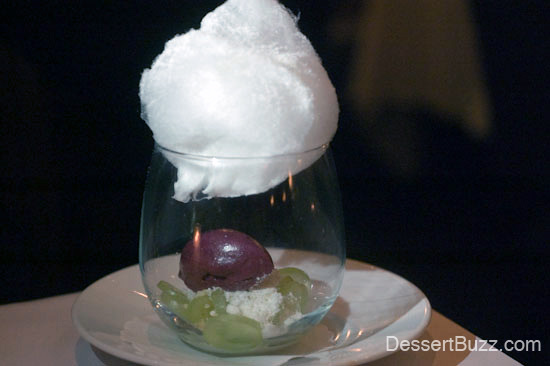 I was on a bike ride a few weeks ago when another rider in the pack, who I am Facebook friends with, said “who made those desserts you posted the other day–you know, the ones that look like miniature terrariums with all kinds of stuff going on inside with all the colors, and was that cotton candy on top? Those were really cool–what restaurant was that from? While it’s true that bike racers love to eat (we’re always hungry) it’s not often a fellow racer asks me about my dessert photos from this site out of the blue. When they do, it’s because a plate is so beautiful or eye catching that they bypass any insecurities BOUT being a little too enthusiastic about desserts–for whatever reason it’s not a cool thing for a bike racer to talk about–and decide to mention it to me. 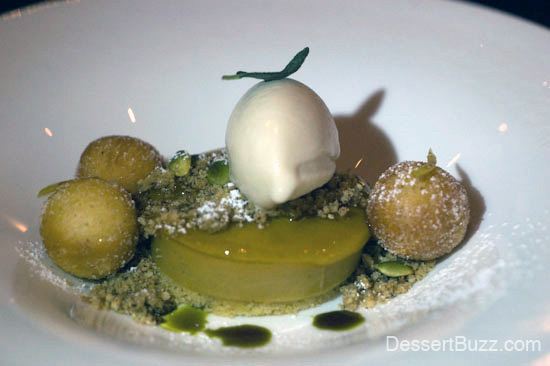 Of course, once the subject was broached I talked for ten minutes about Ashley Brauze’s desserts from DB Bistro Moderne. It was close, but shockingly, my favorite dessert of the night was not one of the two excellent chocolate desserts. Instead, it was the gingerbread cake with molten salted caramel. 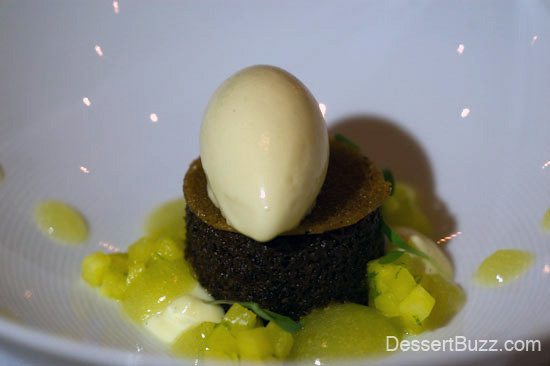 This dessert was made in the style of the ubiquitous “molten chocolate cake” found in many good restaurants. The dish also featured poached pineapple and Chimay ice cream. The gingerbread flavor really came through despite all of the other strong-ish flavors and ingredients on the plate. There was also a perfect amount of cake and molten salted caramel. Really, this dessert was everything that’s great about the molten chocolate cake, but with a new, more seasonal flavor profile. Another superb seasonal dessert served that night was the pumpkin flan. This dessert also seemed to have the perfect proportion of ingredients. On top of the flan–which had a great pumpkin flavor–was a layer of sage caramel. These two ingredients went very well together both flavor-wise and texture-wise (easy to cut though). Three small, made-to-order cinnamon beignets and some hazelnut ice cream completed the plate. Like the gingerbread, the pumpkin flan was a refreshingly new and different dessert which satisfied like a comfort dessert that I had been eating for years. The dark chocolate brownie bar was another keeper. Composed of two long and very thin strips of dark chocolate brownie, sandwiched around a layer of hazelnut ganache, like the layers of fiberglass and wood inside a ski or snowboard. Some frengelico cream and a layer of actual dark chocolate rounded out the “brownie”. Caramelized orange ice cream and hazelnut nougatine added a super-satisfying crunch. If only all brownie sundaes were this good. Due to customer demand I think every fine dining restaurant has to have a “go to” chocolate dessert. 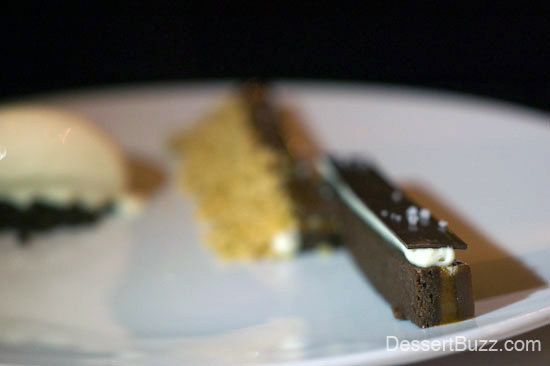 At DB Bistro, in addition to the brownie bar, they have “La lune”, a baked chocolate mousse with coffee bavaroise, crushed amoretti, expresso chocolate sabayon, Kahlua ice cream and a sugar twill. La lune is a perfect dessert to split. The main component of chocolate mousse is quite large. The mousse is baked, making it bit more stable and less butter-like. This might be to support the weight of the other components on top. The panna cotta-like texture and strong coffee flavor of the bavaroise on top of the mousse are what make this dessert great. 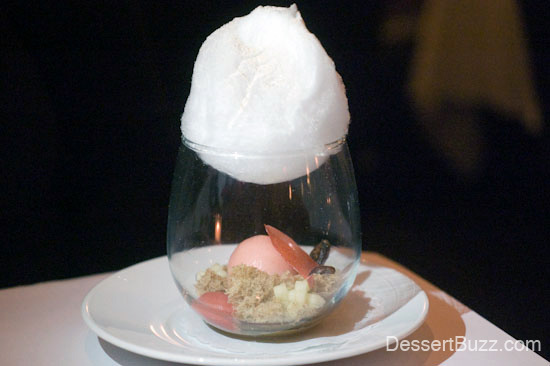 I first met Ashley Brauze two years ago at the 2011 New York Food and Wine Festival Sweet event where she had one of the best desserts of the night. A year later I saw her compete in the StarChefs international pastry competition. And even though it was her first live, real-time contest, she made the difficult first cut from 20 chefs down to 10. “That was my first live competition and I had no idea what to expect–I was glad to just be there.” Ashley was also struck by how supportive and collegial the other pastry chefs in the competition were. “Everyone was helping each other [throughout the competition] with their dishes and was very supportive”. Her pastry resume, which includes stints at El Bulli, Per Se and Daniel, reads like someone who could land a job in one of the top one or two pastry positions in New York, say, as the Executive Pastry Chef at Daniel itself. She loves the Dinex group and says she can’t imagine leaving “it really is like a family”. She says she still has drinks with Jon Laurie Moran (another Dinex alumni who is now Executive Pastry Chef at Le Bernardin). Dominique Ansel, former Executive Pastry Chef at Daniel, says “she is constantly curious, which is a great thing for all chefs! [She also has] an open mind and a good work ethic which makes Ashley a real contender in this industry”. 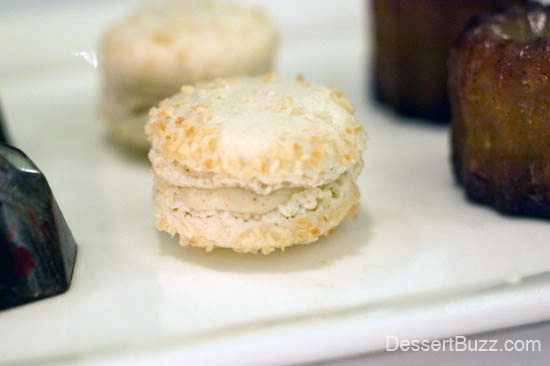 I highly recommend stopping by DB Bistro Moderne for some of Ashley’s desserts. 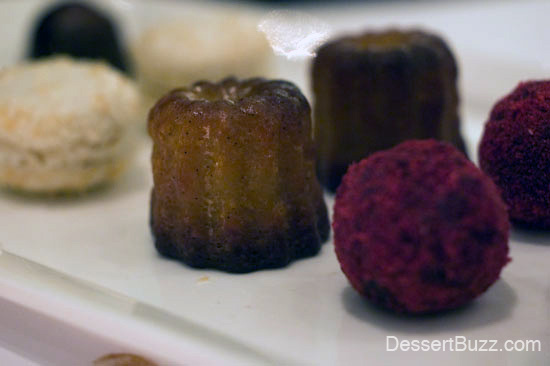 And try a few savory dishes while you’re there–DessertBuzz loves the Coq au Vin. DB Bistro Moderne is located at 55 West 44th Street. Their website is here. 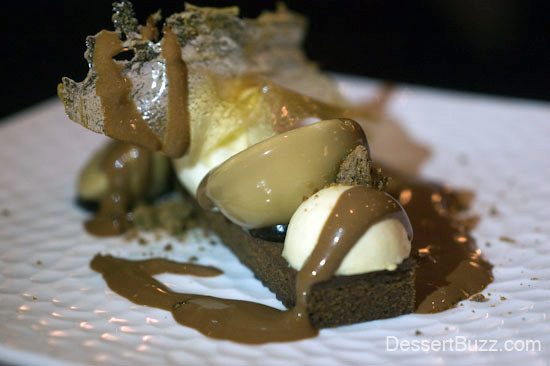 Stay up-to-date on all the NYC dessert news by following DessertBuzz on Twitter.